In the past year, art students have been able to see replicas of their work on view in campus offices and elsewhere around the area by means of OCCC’s art calendar. 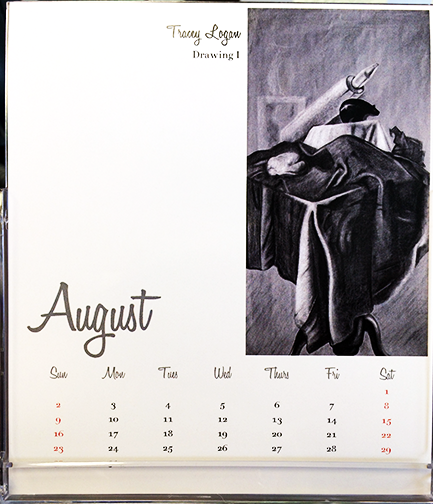 The calendar was originally a promotional product created by former President Paul Sechrist, said art Professor Doug Blake. Each page of the calendar depicts a piece of art made by a student, he said. For August 2015, Tracy Logan has a black-and-white still life from Drawing I pictured. It depicts a rolling pin on a draped table that also contains a round loaf of bread and a small black stylized figure of a bear. For June, Sahid Alpizar has a photograph of the shadowy underside of a wooden pier, extending outward from a sandy beach into a blue body of water. The picture was taken in the Photography II class. The calendar is used to promote Visual Arts and Graphic Communication classes, now called Digital Media Design, Blake said. He said the Arts Division is waiting on confirmation that the 2016 art calendar will be approved for publication. The art for the calendar can be of any medium: painting, photography, mosaic, sculpture or pottery, Blake said. There is only one stipulation: the art must come from one of OCCC’s art or digital media classes. This means art majors or non-majors can submit a piece for the calendar, he said. The professors in these areas can suggest work, but students have to submit it themselves, Blake said. Students can submit work they think is good even without a professor suggestion, he said. All submitted work goes to Professors Randy Anderson and Blake. The professors take photographs of all the pieces submitted. They then curate them into one cohesive calendar. “We are looking for a diverse group of art pieces,” Blake said. The point is to advertise OCCC’s Visual Arts and Digital Media Design classes to potential and current students, he said. Once the pieces are chosen, Anderson edits the photos so they all look uniform and then an on-campus designer puts them together in calendar form. So far, the calendars have been encased in a clear, plastic CD case, with each art piece on a separate sheet. The front of each page contains the month, a small rendition of the art, the artist’s name and the class. The back side shows a larger copy of the artwork. Blake said no format has been set for future years. He said the calendars, mostly used for distribution at conferences, high schools and given to beneficiaries who visit the college, shows that OCCC is proud of its students and wants to show them off.